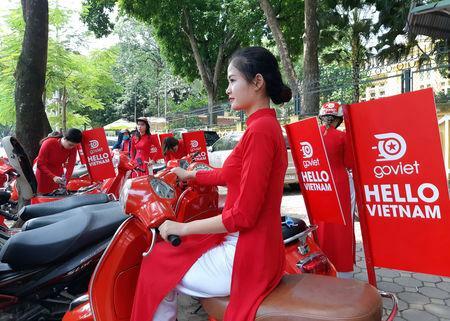 HANOI (Reuters) - Indonesian ride-hailing firm Go-Jek on Wednesday launched its services in Vietnam's capital of Hanoi under the brand Go-Viet, as part of its $500-million international expansion. "We are proud to have seen positive development in Ho Chi Minh City market, and this paves the way for us to expand our services to Hanoi," Go-Viet co-founder and managing director Nguyen Vu Duc said at Wednesday's launch. The launch followed an announcement by the company in May that it would invest $500 million to enter the Philippines, Singapore, Thailand and Vietnam, following Uber's deal to sell its Southeast Asian operations to bigger regional player Grab. On Tuesday, Grab announced a partnership with Vietnam's MOCA Technology and Service company (Moca) for a mobile payment service, as the ride-hailing firm pushes to cement its position. Wednesday's launch was attended by Indonesian President Joko Widodo, who is in Hanoi for an official state visit and a meeting of the World Economic Forum. "We expect bilateral trade to reach $10 billion a year by 2020...and I hope president Tran Dai Quang would work to remove trade barriers for Indonesian products, including automobiles," he said.